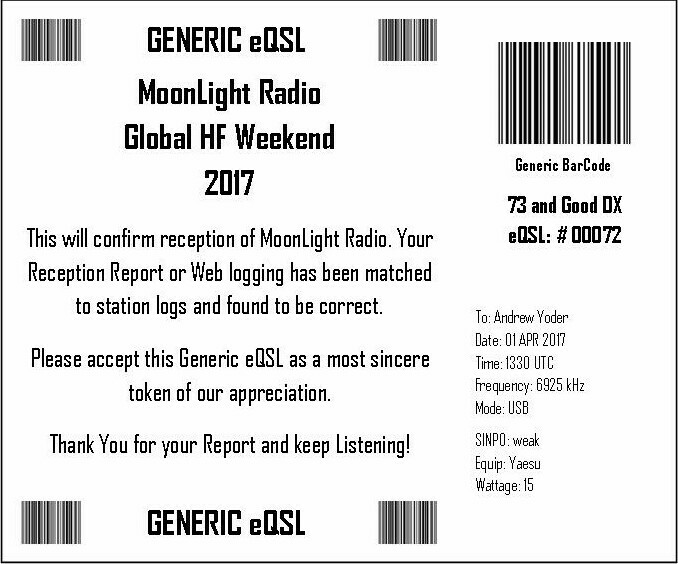 I'll be away from the computer and radio between 1300 and about 1630 UTC, so if anyone wants to schedule a test during that time, please post it on the HF Underground on the Broadcast Announcements page. 1149 UTC Update: The bands are pretty dead right now, as I type this. No pirates are audible on 43m. 15000-15100 kHz is quiet, except for a carrier on 15040, a noise that always seems to be on 15049, and data on 15072 kHz. 21450-21550 kHz is completely quiet. I didn't see any loggings, but I wonder if more North Americans were testing to Oceania on 43m around 0600 UTC last night? Radio Batavia: 1620, 4/2, 1155-1208+ mostly Dutch music right now "Don't Waste Your Time with Only Dreaming," older-sounding novelty song in Dutch, Dutch pop song, REM "Shiny, Happy People." 1620 UTC: I'm back to the computer and radio. I'd heard from one station who was planning to be on at 1500 for a high-frequency test and another station who had planned to be on in the morning (EDT), but nothing has been on. I guess the station ops' plans changed. 1849 UTC: A station set up a test for me on 13870 kHz and if everything worked out, I had planned to announce it. But as he was tuning everything up, something failed and threw the breaker in his house. So, that station is off the air for today (and I hope that it's an easy and inexpensive fix for the station op). 1230 UTC Bandscan: 15000-15100 kHz and 21450-21600 kHz are basically empty here. That doesn't mean that these bands won't be effective for some tests, but tests might not be as successful as on lower frequencies. 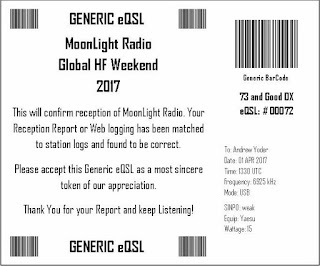 Moonlight Radio: 6925U, 4/1, 1330+ Very weak, funk music with sax. ID per station, who said it was a James Brown song. Thanks for the QSL & the info! 1400 UTC Bandscan: Weak data on 15072 and a carrier on 21505 kHz. Cupid Radio: 15074, 4/1, 1440+ Cupid Radio (ID per op) starting to fade in here, with a YL vocal pop song. I've got some local noise on the freq, but others in North America should be able to hear it well. I've had a few very nice fade ups and I hope it'll keep getting better. 1508 UTC, yes, it does seem to be getting better! 1635 UTC: Cupid Radio's broadcast has been really successful, with loggings on the HF Underground from Pennsylvania, Rhode Island, New Jersey, Mass., Michigan, Kentucky, New York, Maryland, and Virginia. 1700 UTC: Just before 1700 UTC, Joe in Rhode Island heard a very weak station with music on 15075 kHz. 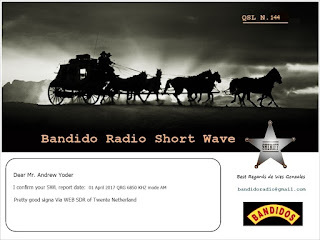 Radio Bandido: 6850, 4/1, 1540-1556* Pretty good signal & I love the IDs with the horses winneying and "Dueling Banjos" in the background. 2000 UTC Update: I finished sanding drywall compound on the ceiling, then swept up twice. Back at the radio now. It appears that the signals are starting to skip long in Europe. If some of those stations will just stay on late, we've got a chance to hear them. 2142 Update: I still have my radio locked in on 6230 kHz, but DimBulb has been hearing a number of Europeans on 48 meters, including Borderhunter on 6210, Laser Hot Hits on 6220, RFD on 6260, Radio TRX (tent.) on 6300 kHz, and possibly some others. XEROX: 6929.3, 4/1, 2220+ Excellent signal with clear IDs, Bart Sambo, & music. Radio Pirana International: 6930, 4/1, 2340+ weak carrier here, but maybe audio will come through later in the evening. Online, the station op said that he's received reports over the past week from US, New Zealand, Germany, & Finland! Only 10 watts.